The Saxons had established a priory in Cranborne in what later became the vicarage garden. Cranborne was known as Creneburne in Domesday records which recorded it as one of the Kings Manors. Cranborne takes its name from the river which winds its was through Pentridge and Verwood to the Moors Valley where it changes its name..
From this date Cranborne Chase was acquired by the Crown when King John hunted. In 1220 STEPHEN'S STONE was recorded as "LE HORESTONE" and was a boundary point in this area so could be a BOUNDARY STONE. - Legend has it that STEPHEN'S STONE, a solitary block of stone in WILD CHURCH BOTTOM has a GOLDEN CASKET beneath it. It is said that it measures 6M X 3M X 3M approx. 1288 VERWOOD was first recorded as Beubos or “Beau Bois”. 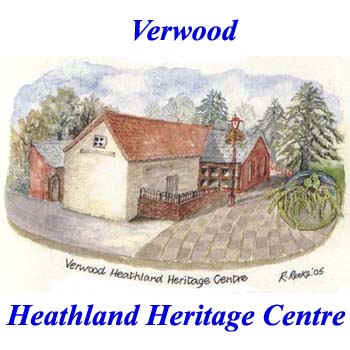 VERWOOD was first recorded. 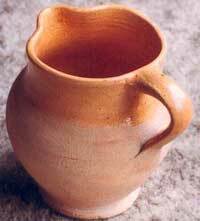 It was developed from FAIRWOODE, FAYRWOOD, WRTWOOD & WEIRWOOD. It is believed that the Black Death was brought into Weymouth in a foreign ship. Verwood was mentioned in a charter dated the 8th December 1377 as “Fairwoode” though the name of its Norman landowners the “Beau Bois” family of Edmondsham is recorded earlier in 1288. In the 1377 charter "all the lands, tenements, meadows, woodland, heath, marsh, pasture, rents and services" which William de Bello Bosco held in Fairwoode, to named persons. Fairwood continued as the official name into the 19th century when it evolved into Verwood. A strange ball on the tomb of Sir Anthony Ashley in Church at Wimborne St Giles represents a Cabbage which he introduced from Holland in 1539. The first Cabbage grown in England was in the kitchen garden at St Giles House. Cranborne Chase transferred from the Crown. The Pretender to the Throne, the Duke of Monmouth, landed on the beach at Lyme Regis with around 80 men. (Follow link for full story). Another serious fire occurred in Blandford which destroyed many more records in the area. This followed the 1579 fire and two smaller fires in 1676 and 1713. Unidentified children orphaned by these fires were given the surname Blandford. The eighteenth century brought with it the building of many turnpike roads. By 1756 there were several turnpike roads from Poole Gate into Cranborne Chase. By this time two more turnpike roads were established in the area, from Winchester through Romsey, Ringwood, Longham to Wimborne Minster and from Ringwood through Woolsbridge, Horton and Thickhorne to Cashmore. Cranborne was found on the high road from London to the west and a turnpike road from Poole Gate to Salisbury was established by Act of Parliament in the reign of George III and a milestone can still be seen on the roadside between Toyd Farm and the Blandford-Salisbury road marking this turnpike. The first CONGREGATIONAL CHURCH (now the U.R.C.) was established but there appears no information of the site of this building. An Anglican mud walled Chapel of Ease in the parish of Cranborne was erected and consecrated on the site of the present Parish Church. The Church of England Infant School was established as a National School when school was held in the church. A Church of England Infant School room to accommodate one hundred and twenty children and a school house were built at a cost of two hundred and sixty pound. John Carnegie (Vicar of Cranborne 1841-72) had the schoolroom built. The railway from Salisbury to the coast arrived in Verwood and was part of the Salisbury and Dorset branch of the London and South West Railway. It was a single track line with a passing loop at Verwood Station. 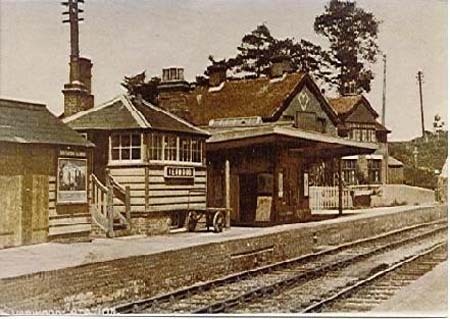 This was a small station situated on the south side of the Albion Inn. The bridge can still be seen. The Anglican Parish Church added a brick Chancel to the existing church. A Primitive Methodist Church was built on the present site. The second CONGREGATIONAL CHURCH was built as the previous 1802 building had "fallen into decay and was deemed unsafe". This is now the Verwood Library. The present Woodlands Methodist Church foundation stone was laid on 8th May 1879 and the building opened in opened on the 23rd October. The land was acquired for £10 on a 21year lease and the total cost of the new building was £582.2.7. The non-conformist day classes becomes the British School. The Anglican Parish Church was in a state of disrepair and the galleries unsafe. These were taken down and the nave was rebuilt using local Verwood bricks. Verwood created a Parish severing its long association with Cranborne. The United Reformed Church in Ringwood Road, 3X, opened its present Church. Kelly's Dorsetshire Directory, 1895 records the 1891 population of Verwood at 1,190. A new chancel and vestry were built in the Verwood Anglican Parish Church, the cost being met by the Reverend Claude Brown M.A. (Wadham College, Oxford), and the churchyard was also enlarged. A daughter Anglican Parish Church was built at Three Legged Cross (All Saints). It was built of corrugated Iron and was known as the tin church. The Verwood Anglican Parish Church nave and western baptistry were dedicated together with the west porch and bell turret. A memorial marble font with a curved oak cover was added together with a wrought iron screen round the font and one at the chancel. Verwood became a Civic Parish. The last meeting of the Cranborne Vestry responsible for Cranborne and Verwood was held.